Home > Squaw Valley Condo with a view of the slopes! Enjoy beautiful panoramic views of Squaw Valley from your mountain getaway condo! Want to know which lifts are running? Look out the window, or step out onto the sunny, south-facing deck with your morning coffee. 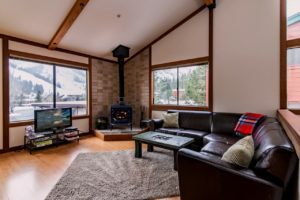 This airy, bright, well-maintained town home is across the road from Squaw Valley ski area, and only 10 minutes drive to Tahoe City and beautiful Lake Tahoe. Vaulted ceilings and a corner unit with one shared wall in a quiet complex. Within walking distance of local hiking trails and year-round shopping, dining, festivals, yoga, spas and live music at the Village at Squaw. Wonderful location for all seasons! Great rental potential and strong rental history.